Want to be a content marketing master? Get our step-by-step plan for turning content into free, organic traffic and get certified as a Content Marketing Specialist! Do your blog posts pack the necessary punch that will turn readers into customers? According to WordPress, 75.7 million new posts are published every month. But even more OPPORTUNITY for YOU to publish posts that will convert your readers. In this article, I’ll teach you everything I’ve learned about creating blog content that converts from my time running blogs at Crazy Egg, Salesforce, and now DigitalMarketer. More content – Make a clear call-to-action (CTA) to read another blog post, watch a recorded webinar, or visit a YouTube video. The goal is increased touch points with your brand. Lead Magnet – Gated offers that require an email address. The goal is to generate relevant leads for an eventual offer. Flash Sales – Deeply discounted offers (over 50% off) on products or services. The goal is customer acquisition and activation of prospects that have been reading your blog for a while but have yet to buy. High-Ticket Offers – Send prospects to a sales page about a higher ticket offer. The goal is offer awareness, not direct sales. For instance, we don’t expect many direct conversions from a blog post to a $1,000 offer. Membership Content – If your blog post is relevant to a product or a piece of content that can be found in your membership group or private community, consider using a CTA for people to get more information and training about the topic. We do that routinely with our paid members area called DigitalMarketer Lab. The goal here is two-fold. For non-members of our membership program, the goal is awareness of all the great content we have available in DigitalMarketer Lab. For members, the goal is increased satisfaction with and consumption of the content available in DigitalMarketer Lab. 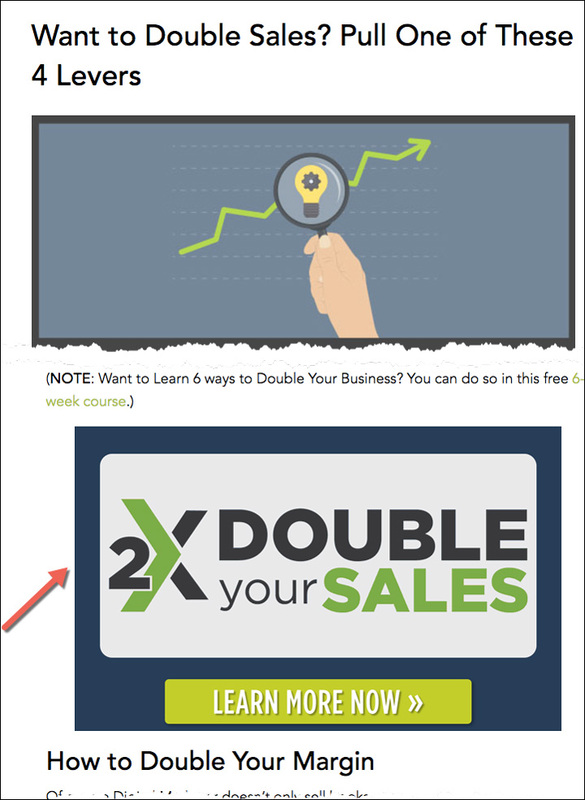 The first example is for an offer that is simply more valuable content like the Double Your Sales mini-class. This mini-class educates prospects (through a free six-lesson course taught by Ryan Deiss) about conversion funnels and email marketing and ultimately makes an offer for our email marketing training, The Machine. A second type of blog post CTA is to a gated offer or what we call a Lead Magnet. In this blog post about Facebook advertising, we make an offer for our Ultimate Facebook Ad Template Library which requires a prospect to give us their email (so we can follow-up with relevant offers using email marketing). A third type of CTA is the deep discount offer called Flash Sales on our products. For example, this blog post makes a relevant offer for our “How to Get Your First 1,000 Blog Subscribers and More” training in DigitalMarketer Lab. There are times when the price point on this is changed from $27 to $7. And lastly, the fifth CTA from a blog post is to our premium membership content. This content cannot be accessed by non-members but we want our members to be aware that there is further training on a topic. And, we want non-members to know that more training is available if they join our membership community. The greater the congruence between the piece of content and the offer — the higher the click rate. For example, a financial planner has created a blog post called “12 Steps to a Happy and Healthy Retirement.” A “Retirement Checklist” that is offered in exchange for an email address (called a Lead Magnet) will convert much better than a “College Savings Checklist” for this particular article. That’s a 10.3% click-through rate on the CTA. This is an article we ran on the blog just to have some fun with our audience on a Friday afternoon. The post highlights a number of bizarre products (like Scratch N’ Sniff Jeans and Bacon Bandages) that people are selling online. But don’t fret — our goal with this Buzzfeedesque blog post wasn’t conversion. We wanted to have some fun with our audience and the amount of traffic, social shares and comments we received on this article indicates that we hit our mark. But if it’s conversions you are after — keep the conversion behavior and the topic of the blog post as congruent as possible. All that said, in most cases, any CTA is better than nothing. If you don’t have an offer that is 100% congruent — use what you have and put creating that offer on your short list of things to do. Let’s talk about the mechanics of writing a blog post that actually gets conversions. Relevance – to the eventual offer you will make. Consumption – of the content (after all, if they don’t consume the content — they’ll never click the CTA). Become aware of a high-dollar product? Become aware of membership/subscription benefits (non-customer) or take advantage of membership subscription benefits (customer)? The first step in creating blog content that converts is to get clear on what that CTA is going to be. So, write the CTA FIRST. What do I need my prospect to believe in order to click on the call to action? What do they need to understand/learn/know before they will convert? What barriers do they have to overcome to convert? What objections do they have to overcome to convert? What are they thinking about/worried about/researching/talking about before they convert on what you have to offer? What is the primary pain point your prospect is experiencing? … needs to believe that they have the ability to run a marathon. … is objecting to running a marathon because of a lack of training time. … is researching the equipment needed to train for a marathon. Do you see how this works? Do you see how knowing your CTA in Step 1 allows you to answer these questions? And do you see how answering these questions will force you to write a blog post that is RELEVANT to the CTA? This is simply a list. The list post is one of the simplest to put together and very versatile. Not to mention — people just love lists. Pretty self-explanatory, right? The post you are reading right now is a How-To post. For many of you, this post type will make the most sense for the topic you have chosen. It can help to break the “how-to” information into steps, phases or categories. In any case, I advise you to begin the How-To post with an outline and write from there. Why create new content when you can aggregate? The Content Aggregator is a hybrid form of the Listicle that uses OPC — Other People’s Content. Use a tool like Buzzsumo to find the most socially viral content on a given topic and aggregate it into one post. This post type leverages the authority of other experts and influencers. Simply ask three or more experts the same question and aggregate the answers into a single post. This is the fastest way (that I know of) to create top shelf content — with speed. Find an embeddable video (think YouTube), Slideshare presentation or infographic (check out visual.ly.) Bonus points if the video, Slideshare, or infographic is already popular. Embed it in your blog post. The title of these posts is usually a variation of the title of the resource you are embedding. OK, time to start talking about a second (but more important) aspect of this blog post: consumability of the content. The more barriers you put in front of your reader — the fewer clicks you’ll get on your CTA. I cannot overstate how important it is to write a good headline for your blog post. It should be clear, and not cute. It should be complete, but not wordy. It should be compelling, but not hypey. The headline is a promise and that promise must be met within the blog post itself. That’s the unofficial pact you’ve made with your audience. Don’t violate it. The easiest way to write good headlines — is to use a headline swipe file. You can download DigitalMarketer’s headline swipe file here. A headline swipe file contains formulas for headlines that have worked for decades. But don’t just copy these headline formulas verbatim. Instead, grab a cup of coffee and read through each one a few times. Try to determine WHY the headline works. Once you understand why each headline works — you’ll be able to start crafting your own headlines that are variations of the formulas in your swipe file. If your headline gets their attention — they’ll read the first line of the post. What will they find? An intimidating block of text filled with long, scary words? Your challenge as a writer is to take a body that is in the resting state and put it in motion (e.g. scrolling down the page). Once that body is in motion — it’s easier to keep it in motion. But that first few sentence is critical. The job of the first sentence is to get the second sentence read. And the job of the second sentence is to get the third read. And so on. The combination of these three elements will lead get your reader in motion. Legendary copywriter, Joe Sugarman, calls this “The Greased Chute.” Imagine your reader is sitting at the stop of a slide. You want to make that slide as slick as possible to get the reader “sliding” down the page. These openings are simple to read and raise curiosity and anticipation in the reader. After you have your blog post completely finished — return to the introduction and be sure that it is as “slick” as possible. Your conversions will go up. When you move from one idea to the next — you are raising a stop sign. And stop signs are bad. Concentrate on your transitions and your consumability will increase. And greater consumability = greater conversion. Notice how each of these transitions keeps the reader moving. … to break up the text. Think of your reader as a bicyclist that is sitting still at the beginning of a mountain biking trail. Now, turn your blog post on its side visualize the peaks and valleys in your article. Use this “Peaks and Valleys” trick to visualize the likelihood of our cyclist prospect reaching the CTA. If you see too many peaks and not enough valleys — you’re making it tough on the prospect. Use formatting to make the ride easier. Your reader came from somewhere. Remember, your goal is CONVERSION by way of greater CONSUMPTION. One of the best ways to get a prospect to read deep into your article is to “tease” some aspect of the article from the source of the traffic. For instance, in this email, we are promoting an article with 11 email tricks. In the P.S. of the email, we “deep tease” the 5th trick to encourage consumption. As we all know, the headline is the most likely part of this post to be shared on sites like Twitter, Facebook, and LinkedIn. Those that click on this headline are encouraged to dig deeper into the article. Use both text links and graphics (banners) as calls to action in your blog posts. Your reader is used to clicking on text links — so provide them. But don’t forget to draw attention by building a banner as well. You can use a tool like Canva to build outstanding banners without needing to be a pro graphic designer. Oh… and one more thing on these calls to action. Be sure to include a button on your banner. People are used to clicking on buttons. You can download a little piece of code that you can paste into the code side of your blog editor by clicking here. This is a simple report to set up inside Google Analytics. Start by opening the BEHAVIOR > EVENTS > PAGES report. Simply add another “pipe” for each page you want to include in your reporting. Lastly, if there are pages that you DO NOT want to include in your reporting, you will want to use the ADVANCED FILTERS to EXCLUDE those pages. For example, we might have links to our “Ultimate Facebook Ad Template Library” on our About Page that we do not want to report on. So… what about the other 90%? Blogs are made up content. That content is divided into categories. What do we know about someone that visits an article in the RECIPE category? What about the CRAFT PROJECTS category? Home decor? We know something about these people, right? The first is interested in cooking. The second in crafts. And the third — well, I think you get the idea. They’ve segmented themselves by visiting a piece of content. And what if I told you that you have the ability to run ads on Facebook (and other ad platforms) based on the pages they’ve visited on your site? Interested? Well — we’ve got an entire article on this blog that will teach you how this works. Click here to learn more about using blog content to retarget your prospects on Facebook. So, now you’re ready… You’ve got everything you need to write blog posts that sell. Start turning prospects into buyers today. Previous Post Answered: What Tools Do I Need to Run an Ecommerce Business?